Art fans – a warning: this isn’t really art related, but I wanted to ‘offer this up to the world’, so the more spots I can place it, the better. 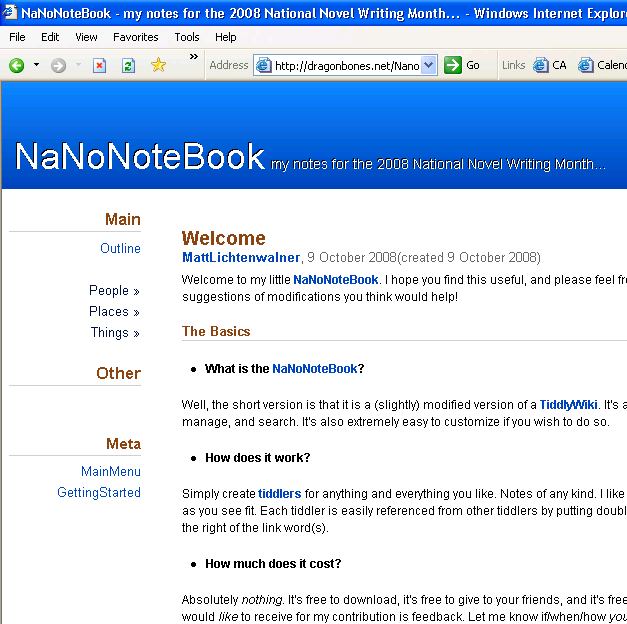 I think that I’m going to take part in NaNoWriMo this year. I’ve never done it before, but it seems like a Really Good Thing™, so here goes. As many of you who know me personally know, I’m a huge fan of Jeremy Ruston‘s free wiki notebook TiddlyWiki. I’m currently working on a modification of that delightful file for use by authors – especially NaNo authors. I’m not doing anything major with the structure or functionality of TiddlyWiki, but rather just setting up the navigation and menu structure in a way that will (hopefully) help authors get started using this amazing tool with less time trying to figure out some of the details. If you’d like to see what I’ve got so far, check out the online version. As I said – it’s not finished yet. Keep an eye here, and I’ll let you know here when it’s ready.